The belt of conveyor of concrete batching plants, after being used for a period of time, slides location frequently, especially in rainy days. That’s because the rain increases water in aggregates and the inner side of belts, which further reduces force of friction between belts and conveying rolls, and correspondingly the torque sent by rolls to the belt decreases to such a degree that it’s smaller than needed for aggregate delivery. Eventually that leads to location sliding of belts. Then how to solve the problem of location sliding of conveyor belt of concrete batching plants? Since small friction force proves to be the reason for the problem. The most efficient way should be strengthening the force of friction. Generally speaking, there are four ways you can try. First, increase the counter weight of tensioning gears for the belt or tighten the line regulating pole. In this way, positive pressure between the belt and rolls increases to reach friction force needed for moving the belt. Second, you can adjust tightening rolls near conveying rolls so that the cover angle of the belt and rolls will be enlarged, which helps to increase force of friction. Third, you can also cut grooves into the rubber cover of the rolls. That can improve friction coefficient of the rolls. Fourth, if the problem can not be solved with the three methods mentioned above, you have only one choice: replace anti-slip rolls. 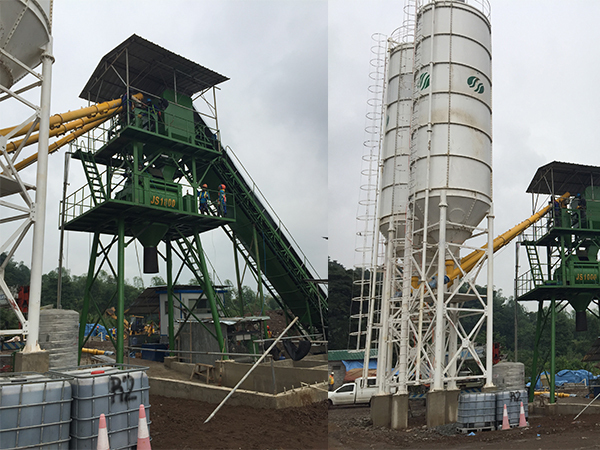 In a word, to solve the problem of location sliding of conveyor belt of concrete batching plants, you can first try simpler and cheaper ways like adjusting relative components. If you fail with these methods, however, that means the whole rolling system has to be replaced. You have no choice but to buy a new set. We are professional manufacturer of concrete batching plants with over ten years of export history. Welcome to contact us at april@concretebatchplant24.com or wechat/what’sapp 008615838029491 for more information.